As most of you know, our shooting range was closed from December until the 3rd week of March, during which time new ownership took over. This left my normal Saturday morning shooting time wide-open. This allowed me the opportunity to peruse local gun shops and gun shows looking for vintage Colt and Smith & Wesson double-action revolvers. At first this search was very disappointing, not that the vintage models in acceptable to fine condition were not available, in fact they are. The problem that arose was price. If one was to find a good specimen of a Smith & Wesson triple-lock or a Colt New Service revolver, and I found many, you were generally looking at $800 to a grand for a shootable, but very used gun. Triple-locks and New Service revolvers with most of their original finish and sharp, uncracked grips ran in the neighborhood of $1200 to 2 grand. Finally another collector clued me in that, if I were to look at revolvers in some of the more unpopular calibers, acceptable pricing could be found. As I began to look, I found that vintage revolver in .22 Long Rifle, .38 Special, .44 Special, .44-40, .45 ACP, and .45 Long Colt commanded the highest prices. While revolvers in .32 S&W Long, .32 Colt Police, and .38 Smith & Wesson, tended to languish on dealer’s shelves and on gun show tables which brought their prices down. That brings me to the three finds, two from gun shops and one from a gun show. Your first question might be what is the difference between the .32 Colt Police round and the .32 S&W Long cartridges? The answer is: Nothing. They are exactly the same round. Smith & Wesson developed the cartridge first and began marketing it for personal protection, small game, and law enforcement. Colt realized that they needed to catch up so that produced their own revolver, aimed at police sales and dubbed it the Police Positive in .32 Colt Police. 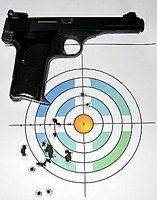 It is unclear whether Colt was afraid of a lawsuit if they claimed to use the same round or if they did not want Smith & Wesson’s name in their advertisements, but the result is the same; the rounds are interchangeable. Both of these revolvers were born in the days before the beginning of the last century. The Police Positive was adopted by New York City Police Commissioner Theodore Roosevelt as standard issue to the NYPD. Prior to Roosevelt police officers supplied their own firearms in whatever caliber they wanted. Also, there were no formal firearms training standards. The story goes that Roosevelt decided to change all of this after two officers were trying to shoot a mad dog and wound up hitting quite a few civilian bystanders who came out to see what all the shooting was about. After quick research and testing Roosevelt settled on the Colt Police Positive in .32 Colt Police. 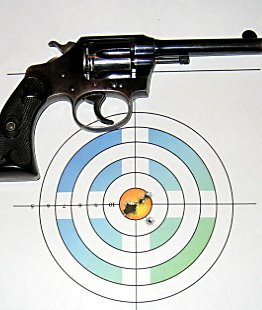 He made his decision based upon his personal finding that the revolver was superior in the accuracy department. I found this Police Positive collecting dust on the shelves of the Boise Gun Company for the princely sum of $179.00 (compared to a Colt New Service revolver in .38-40 caliber next to it with almost no original finish and priced at $900.00). It is difficult to see from the picture but the gun only retains about 50% of the original bluing and virtually none on the backstrap. While this specimen must have seen some pretty good use, the cylinders locked up tight and the bore was in excellent condition. The small front sight is very thin and the rear sight very narrow and shallow. I was concerned about the ability to accurately and consistently place shots from this pistol. 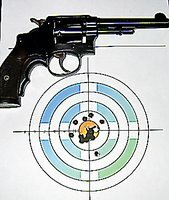 The target below was shot double action (fairly slow-fire) from 21 feet using 6 Federal Classic 98 grain Lead Round Nose bullets. I always thought that TR was a great leader and great politician. He was also undoubtedly also a great police commissioner because he was certainly right about the accuracy of this revolver and the .32 ammunition. The Federal ammunition was the most accurate I fired from both revolvers; however the cases expanded in the chambers, many of them cracking. It took quite a bit of effort to eject the fired cartridges. This little revolver is serial number 1270005. The dealer told me this meant that this was the 5th revolver produced in Model #127 which was the Police Positive. If that is so, then this is a very old specimen. Perhaps this was one of Roosevelt’s test guns. The Smith & Wesson Hand Ejector got its name due to the fact that this was Smith & Wesson’s first swing open cylinder which used your hand to push the ejector rod to dispel the cartridges. 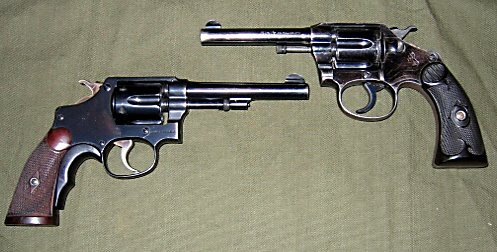 Prior to this model Smith & Wesson handguns were of the break-top variety which automatically pushed the shells out as you opened the revolver. This specimen is in much better shape than the Colt. Most of the original finish is intact except for a little wear at the front of the barrel and some very minor pinpoints of rust on the backstrap and right side of the frame. 99% of the rust was easily removed Outer’s Rust Remover. This was a gun show find and, due to condition cost almost twice as much as the Colt. The seller also had a Hand Ejector in a slightly more used condition chambered in .38 Special for $749.00. I added a Tyler T-grip adapter to the gun, not because of recoil, but because it made the grip more comfortable to hold while allowing the gun to retail it’s classic profile. I will add one to the Police Positive soon. This was 12 rounds fired double-action at 21 feet using a more rapid rate of fire. While the .32 long ammunition is certainly not a high-power round, it was very popular in its day. Back in the early part of the last century, your other choices would have .38 Special, .44 Special, .45, .38-40 and .44-40. At the time the .38 Special Lead Round Nose ammo was similarly anemic while the other rounds were difficult for some people to handle (the .38-40 and .44-40 were actually rifle cartridges). So what you lost in power you picked up in accuracy, which is not at all a bad thing. I am a big fan of the Colt Pocket Hammerless pistols (designed by John M. Browning) especially in .380. I currently own one example from each caliber (.25 ACP, .32 ACP, and .380 ACP). However a Pocket Hammerless in .380 that is still in good shape will run upwards of $800.00). Therefore I was very interested when I found this Browning Model 1910 .380 ACP in very good condition for just a few dollars under $300.00. The pistol was produced from 1910 to 1972. In 1968 Browning had to add adjustable sights, grips with a right side thumb rest and a magazine extension in order for it to qualify for importation after the Gun Control Act of 1968. As my pistol has these features it is obviously a later production model. The “claim to fame” of the Model 1910 is that it was the pistol that started World War I. The Browning 1910 was used by a Serbian assassin to kill Archduke Franz Ferdinand of Austria. The model 1910 is large and heavy compared to .380 caliber pistols on Today’s market. However this specimen did not shoot well, despite adjustable sights, it kicked like a mule, and the grip safety, backstrap and slide release were sharp and bite the web of my hand. Somehow Browning was able to take this heavy pistol and make it kick like a .45 ACP. To sum up; uncomfortable to shoot and inaccurate, however if you think this pistol is kind of cool, it will be in the used gun case at Cliff’s Guns, Safes, and Reloading in Boise by next Saturday. Cliff does advertise on Guns America.com and ships UPS. Lastly I would like to share two good cleaning products with you. 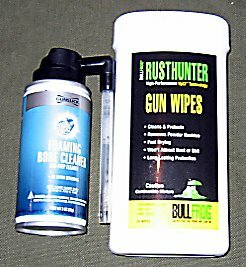 Outers Foaming Bore Cleaner and BullFrog Rust Hunter Gun Wipes. The Foaming Bore Cleaner is the best product that I have found for removing lead, powder, and most importantly copper fouling from pistol barrels. The Gun Wipes are a very convenient product and do a great job of cleaning the grime off of the rest of my revolvers and semi-auto pistols. The Gun Wipes do state however that they should not be used on wood or plastic, so you Glock toting polymer princesses be warned, these wipes are only for men who pack real steel.